At the heart of the MACSQuant Tyto Sorter lies the MACSQuant Tyto Cartridge, a single-use disposable, carrying the actual sorting microchip. The MACSQuant Tyto Cartridge consists of three compartments that can be accessed from above: the input chamber, the positive, and the negative sort chamber. Cells suspended in the specially formulated MACSQuant Tyto Running Buffer are loaded into the input chamber of the MACSQuant Tyto Cartridge. The input chamber contains an adjustable propeller, which keeps cells in suspension during the sort. After loading the cartridge into the instrument, filtered air is applied to the input chamber through a pressure inlet. Driven by very low air pressure (< 3 psi), fluorescently labeled cells flow from the input chamber, via a microchannel, through the microchip. The default destination of cells is the negative sort chamber. Within the microchip, cells are interrogated by three lasers. Fluorescent and scatter light signatures are used to select target cells, which are then redirected by a sort valve located within the microchannel. To redirect a target cell into the positive sort chamber, a magnetic field is applied to the microchip. This triggers the sorting valve to open and therefore changes the flow of the target cell towards the positive sort chamber. After a positive cell has passed through, a silicon spring returns the valve into its original position. Curious how cell sorting within the MACSQuant Tyto Cartridge works? 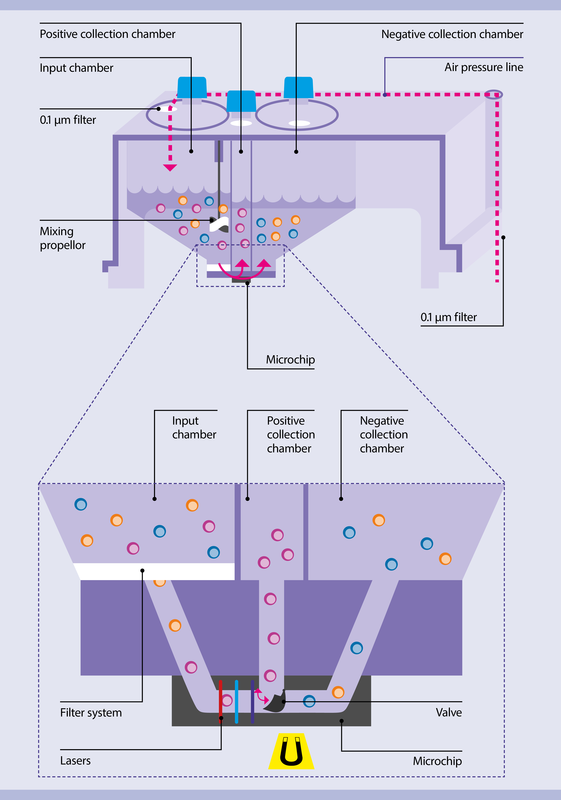 Learn in detail how the unique microchip-based technology enables high-speed, fluorescence-based cell sorting with the world’s fastest mechanical sort valve. Sorting your cells has never been more gentle and reliable! In this webinar, learn about microchip-based cell sorting on the MACSQuant Tyto Cell Sorter. Find out how cell sorting within a closed cartridge system allows for a more gentle and sterile approach than conventional droplet sorting.